PRO ADVICE: 3-Step Guide to Finding Hot Products! As a new dropshipper it can be overwhelming to decide what to sell. You want to find a product that has good margins, is high-quality so returns aren’t a problem and one that’s light so it can be shipped with ePacket! Most importantly, one that your customers actually want to buy so your marketing investments have positive returns. The best dropshippers don’t sit around and look at what’s beside them for ideas, they do research to see what they think will be the next hot product. As an avid trend and product hunter I’ll be sharing my step-by-step guide to finding your next winning product using only free resources! The question about niche and general stores comes up all the time and there simply is no right answer. There are successful products in every category and it just depends on what you want to sell. If you decide on a general store you can reuse these steps for each category you want to include. Start by picking a generic niche you want to explore products in. If you’re starting a niche store I usually suggest choosing something you are vaguely interested in as you’ll be more knowledgable about it. For this example I’ll be using “Yoga” as a starting point since I go to yoga classes regularly and have a decent understanding of the community and what types of audience I will be targeting. Now that you have a starting point you want to see what’s popular in that category to narrow your search. There is a few different ways you can do this and I'll be sharing a few resources that I have found to be most efficient in my search. Remember to keep an open mind when looking for products in terms of what can be cross sold. For example, resistance bands were never part of yoga classes but the close relation with pilates has changed this and now they are a staple in the yoga category! Amazon Bestseller’s: Has a list for each category that includes order numbers and reviews. Additionally it offers to separate into new releases, most wished for and gift ideas! 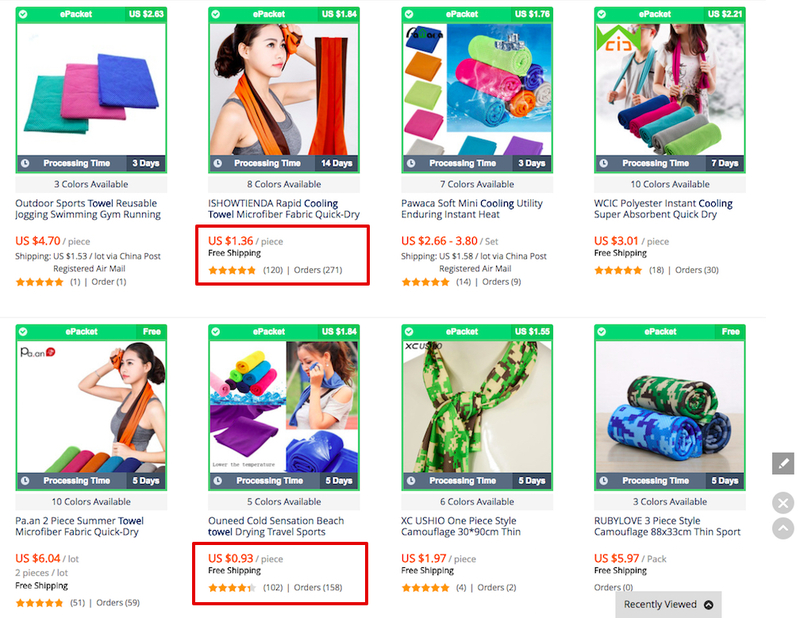 Aliexpress Hot Products: Shows a grid of the popular products in categories overall and weekly. There’s also a Top Selling list that shows the most popular 10 products on the platform with order numbers. Great for general stores! Ebay: While it does not have a dedicated bestsellers list there is a Hot this Week section to highlight best selling products. It does offer a detailed search and once you click on the product it will tell you how many were sold in the last hour. Great to see just how “hot” this product is! 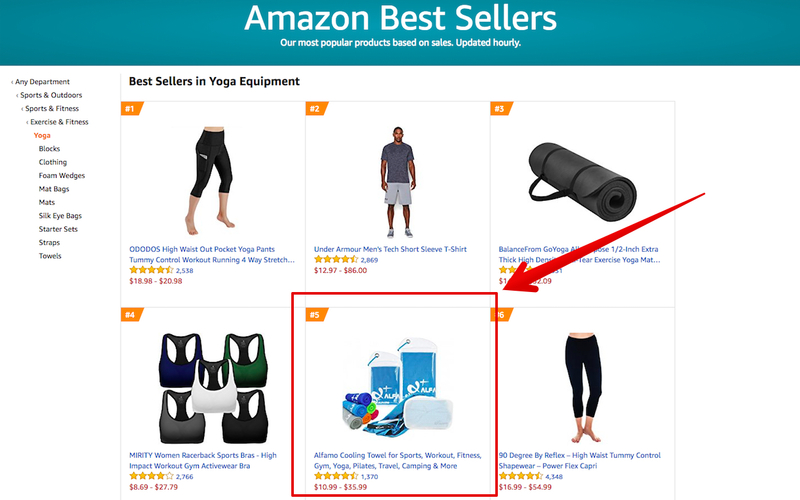 After some research it looks like other than yoga clothing and basic mats that the two most popular accessories are resistance bands and cooling towels. Resistance bands seem to be everywhere from multiple stores and suppliers so we’ll focus on cooling towels, less competition will only make things easier! Now that you have a product in mind it’s good to validate it with research. First go to Aliexpress and look up the product you’re interested in selling to see the reviews and order counts. Over 100 means it’s decently popular and over 1000 means it’s very popular so prepare for some potential competition! When I looked up cooling towels I found more than a few options with over a 100 orders and very good reviews. Looks like this product is in demand and once they’ve received it the customers have been satisfied. Also it’s got ePacket available from almost every supplier so you know it will be getting to your customer in a decent time! Once you know customers are ordering the product you want to double check the trend in relation to time of the year. Santa hats may have thousands of orders but selling them in the summer wouldn’t be effective. 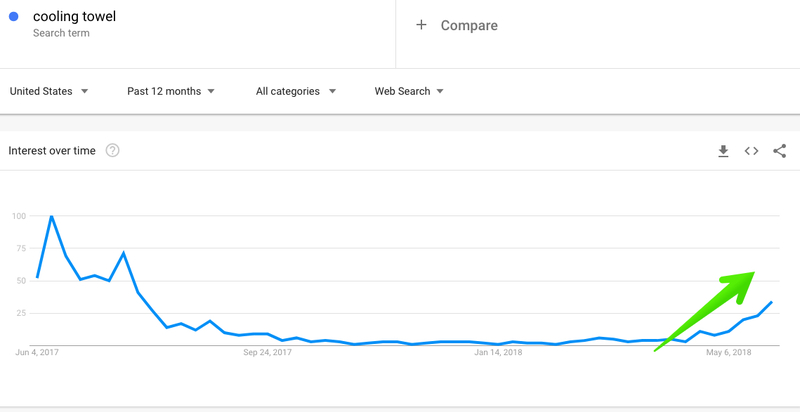 This is where Google Trends comes in! Do a quick search to see how many hits and searches the product has had and it’s history. You might think the drop last year is a bad sign but looking to the right we can see it spiking back up for the summer. If the left side is any indication of a pattern, this product will continue to grow in demand for the warmer months. Also don’t forget to scroll down to see where this product is selling best to help with building your ads audience! When you’re dropshipping products that have been well researched and have proof to back them up you can feel confident moving forward with your business and investing in ads or reaching out to influencers. Although everyone has their own way to find products I hope my method has added some insight for you. What's your favourite tool to find new products to add to your store? I'd love to hear!